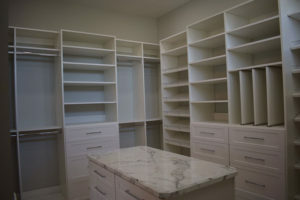 Custom closets in Tampa, St. Pete, and Clearwater. If you live in the Tampa Bay Area, your custom closet will become your own hidden oasis. Your closet isn’t merely a place to hang your clothes. 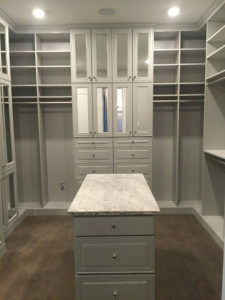 When you trust Gloger Construction to build a custom closet for your home, your closet space will transform into a personalized retreat that meets all your organizational needs with a mixture of beauty and function. 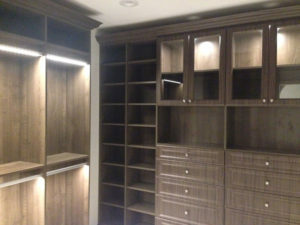 We offer the knowledge, skills, and experience necessary to uncover the hidden potential of any bedroom closet, large or small, in order to make your vision a reality. Whether you want to customize your large walk-in closet or standard “reach-in” closet, Gloger Construction offers a variety of shelving and drawer styles to maximize the use of your space. We will take advantage of every square foot to strategically store and display your wardrobe. Whether you want to build a space of ultimate luxury or a more classic and elegant showcase, we can make it happen. A large center island or countertop is a favorite feature for many clients looking to display collectibles and decor. All of your belongings deserve a special home. From purses, belts, and jewelry to shoes and hats, the team at Gloger Construction can design a cohesive organizational scheme for everything. Choose from a wide array of systems and configurations that protect and display your prized possessions. Drawers, shelf dividers, and jewelry dividers can keep your smaller items organized, while pull out racks, cubbies, and display cases make your shoes easy to access. At Gloger Construction, we will work directly with you to design an organizational scheme that caters specifically to your needs. Since a closet is a relatively small space, colors and lighting techniques can make a huge difference in how the room feels. We offer the highest quality products in numerous woods, whites, and darks. There is so much potential for lighting as well, from under-the-counter lights and recessed ceiling lights to beautiful natural window lights. It is our job at Gloger Construction to cultivate the perfect atmosphere for your custom closet space. We offer customized closet solutions for closets of every space and size. We are happy to assist you with the selection of materials, layout, and design, so give Gloger Construction a call today to find out what potential your closet holds!